Want to see more episodes of Bee and PuppyCat? You can help make a series happen by pledging a few dollars toward its crowdfunding campaign. You can also back a new game from the makers of Myst and Riven, and a nonfiction book about the bizarre adventures of well-traveled corpses. 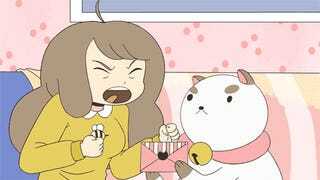 Natasha Allegri's animated short Bee and PuppyCat won our hearts and now Cartoon Hangover's Frederator Studios wants to turn it into a full series. The goal is to produce six six-minute episodes, with the first to be released in summer 2014. The team is offering various digital perks, including ringtones, access to the backers blog, the soundtrack, and episode downloads at various reward levels. Cyan is offering the game to backers for a $25 pledge.